Examples: flowables and bleaching gels. 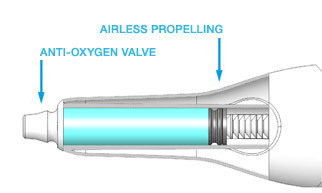 The Preciquant™ dispenser uses a patented airless propelling system based on a lever. The Preciquant™ dispenser can be equipped with a specific nozzle that does not allow oxygen to enter the container. The efficiency of the product to dispense is preserved and the treatment efficiency is increased. The device can either be delivered in bulk, assembled, filled, packed, boxed, clean or sterile. The manufacturing, filling, assembly and packaging can be made by Primequal™, a sub-contractor of the customer or by the customer himself based on a license. Primequal can process the device in ISO clean rooms (8, 7, 5) and through multiple sterilization technology.